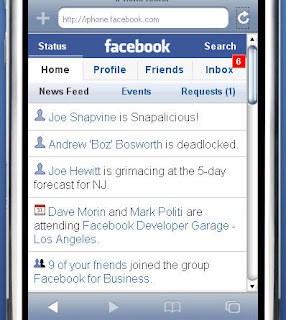 Facebook apps on iPhone. Pretty cool and nice and I m sure you will agree with me once you check out the video clip below. Those Facebook's guys had definitely came out with killer app for iPhone. More reason for me to get hold of an iPhone when its released in China. I had almost no excuse not having an iPhone having seen this clip myself. It is intuitive, has simple navigation, and was just a dream to play with. I am quite impressed with the simplicity of design and overall performance of the application. These are not easy things to accomplish when taking a website and making it available on a mobile device. With the iPhone facebook application you can access the following: News Feed, Events, Friend Requests, Profile, Info, Walls, Photos, Friends, email (sent, delete, send), Friend status, friends online, friends photos, search for friends, etc. You can quickly drill down into almost every area effortlessly. This is a dream to use and is very efficient. Have Fun!